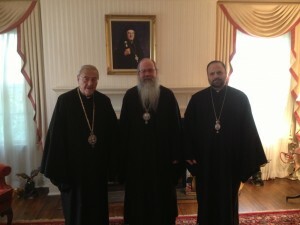 For the first time since his election as Primate of the Orthodox Church in America in November 2012, His Beatitude, Metropolitan Tikhon was the guest of His Eminence, Metropolitan Philip at the offices of the Antiochian Orthodox Christian Archdiocese of North America here on Tuesday, May 14, 2013. 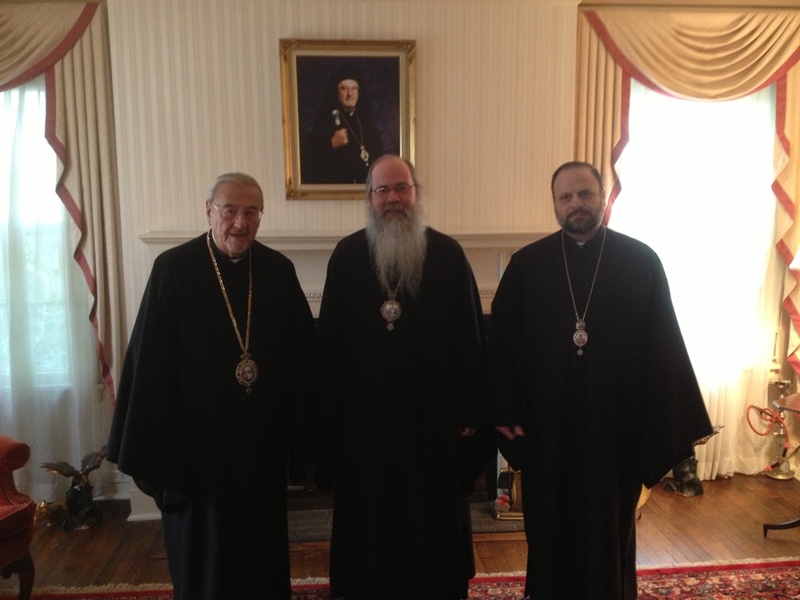 Metropolitan Tikhon was accompanied by Archpriest John Jillions, OCA Chancellor; Archpriest Leonid Kishkovsky, OCA Director of External Affairs and Interchurch Relations; and Subdeacon Roman Ostash. Joining Metropolitan Philip in welcoming the OCA delegation was His Grace, Bishop Nicholas, Auxiliary-Brooklyn and Resident Assistant to Metropolitan Philip; Archpriest Thomas Zain, AOCA Vicar General; and Archpriest George Kevorkian, AOCA Assistant to the Metropolitan. A warm atmosphere provided the context for substantive conversations about the current plight of Christians in the Middle East—and specifically the situation of the two Syrian hierarchs who remain in captivity—as well as the OCA’s recent history, the ongoing work of the Assembly of Canonical Orthodox Bishops of North and Central America, and hope for a united autocephalous Orthodox Church in North America. A gallery of photos may be found on the OCA web site and OCA Facebook page.